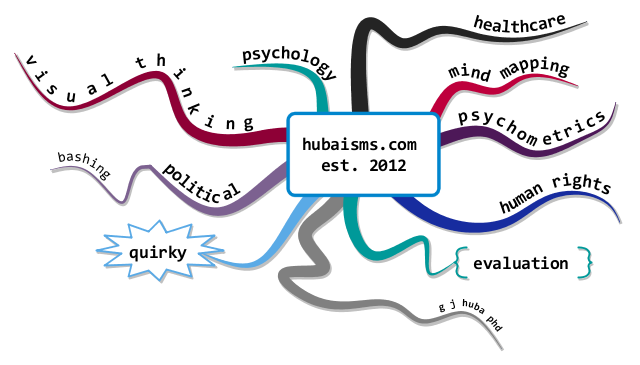 This is one of a series of posts on Huba’s Integrated Theory of Mind Mapping. To access a complete index with links to individual posts click here. 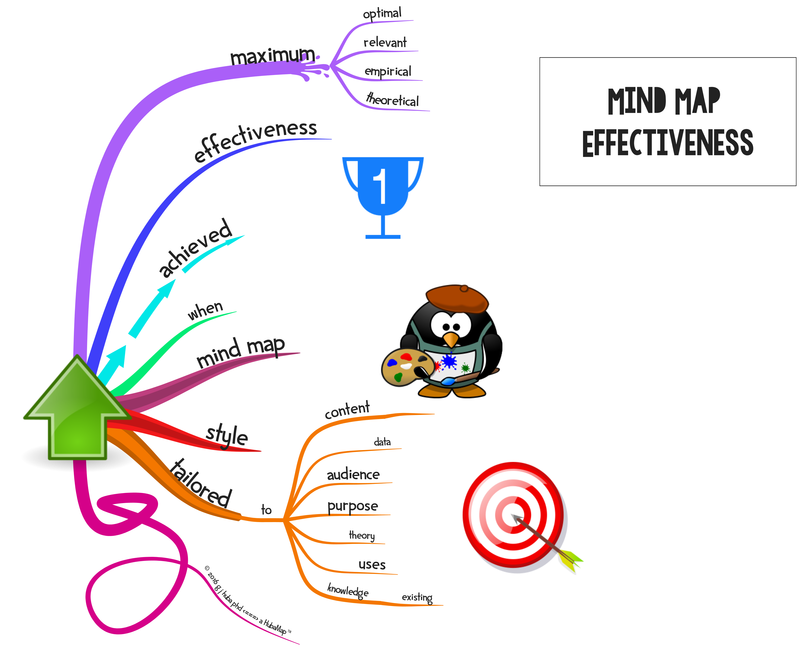 What makes a mind map effective? A few thoughts in the following mind map. Click on the image to expand it. 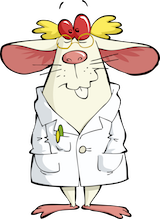 Tailoring the mind map style to the content of the map, audiences, and related factors makes the mind map maximally effective. Sadly, I seem to be the only one writing about the use of tailoring of maps to users, content, and applications. It is my belief that such tailoring is the most important way to make a mind map meaningful and effective. There is no such thing as a mind map style which is “the best” for all applications in spite of various pronouncements over the past 40 years that you must curve branches or center the map on the page and use a radial structure and have one word per branch if you want to have a “real” mind map with an optimally useful mind map. What is best is what works best for what YOU are trying to do with the map. There is no one universal formula for the best mind map in all circumstances. You should use your experience mind mapping and content knowledge to customize the style for maximum effect. If you do not feel comfortable customizing a style, you can use Buzan’s Guidelines and achieve a good result. Following Buzan’s Guidelines almost always produces a good or very good mind map and should be your default as a starting point. Customizing can improve the map at the expense of requiring experience and some additional time. As you mind map more, you will find that you develop a fairly advanced and useful knowledge of mine map style in different applications of the technique. After I develop my first draft of a mind map — either in a standard default style for iMindMap or a standard custom style I have developed for my own use — I systematically try changing color schemes, fonts, branch placements, images, shapes, branch formatting, and other elements of the map to see which combination seems to best fit the intended audience and the information I am using. This is NOT an aesthetic judgment; while pretty is often very good, the prettiest map may not be the most effective map if the map violates assumptions that patients or doctors or scientists or engineers or students about how information is presented, which concepts are usually discussed, and systems of color coding that are well established (and usually invariant) in various professions. For instance, red, green, and yellow are virtually universally used to mean stop, go. and caution. Hot is usually coded with red and cold with blue. Some judgment is required to optimize mind maps. Experimentation with alternate styles and pilot testing with yourself and several others can help determine which of several alternate map files may be most effective and help you to evolve a very effective style.